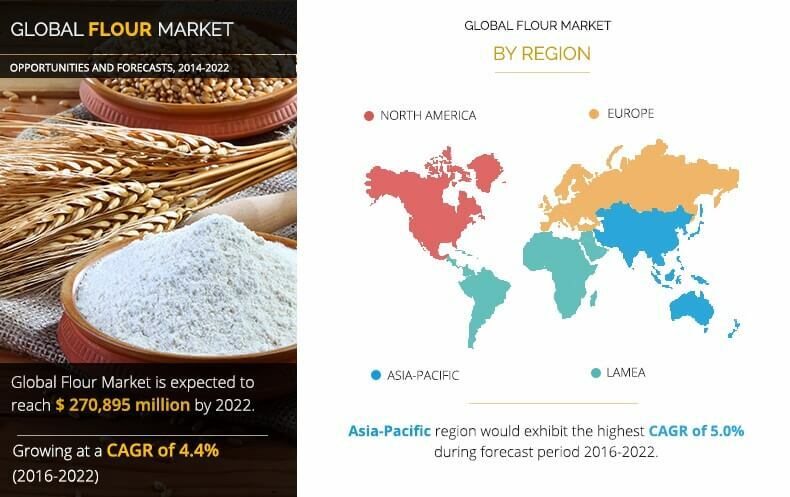 Global Flour Market was valued at $200,497 million in 2015 and is expected to reach $270,895 million by 2022, registering a CAGR of 4.4% during the forecast period 2016 - 2022. Wheat is the most widely produced cereal in the world, most of which is for human consumption. Flours are used as an ingredient in the making of bread, bakery items, and corn-based coating of fried food and fast food. In fast food restaurants, the consumption of flour is high as they serve food items such as donuts, burgers, cakes, and fried meat. The growth in population coupled with per capita income has increased the demand for flour, which has further raised the production of flour. Change from traditional to urban and modern lifestyles of consumers has increased the demand for various types of flours in the preparation of fast foods items. Moreover, rise in health concerns for high-protein flour provides an impetus for flour millers to produce gluten-free flour alternatives. Change in taste and preference of consumers as well as dietary concerns for manufacturers to develop differentiated products have impacted the overall sales. Owing to improper warehousing influences, the flour industry faces major problems in the form of contamination of the food grains. Expansion of commercial farmlands and growth of aquatic feed industry in Asia-Pacific impact the application of flour in the form of animal feed. Rise in urban and modern lifestyle has increased the demand for various types of flours in the preparation of fast foods such as pizzas, donuts, fried meat items, and burgers. Flours are used as a principal ingredient in the making of bread, bakery items, corn-based coating of fried food. Moreover, the increase in number of fast food restaurants also boosts the market growth. Increase in health concerns for high-protein flour gives rise to demand for flour millers to make product innovation by using gluten-free flour alternatives such as maize flour, rice flour, soya flour, and corn flour. Private flour millers in Asia-Pacific have initiated the private players to increase their production capacity and innovative product offerings owing to less stringent regulations of government control on the flour industry. Increase in average selling price for flour in most of the countries has positively impacted the growth of market. The global flour market is segmented based on raw material, application, technology, and geography. Based on the raw material, it is divided into wheat (including durum flour), rice, maize (including corn flour), and others (including oat flour and rye flour). On the basis of application, it is categorized into bread & bakery products, noodles & pasta, animal feed (including pet food), wafers, crackers & biscuits, non-food application (including bio-plastics, biomaterials, glue), and others (including roux, baby food). Based on technology, it is bifurcated into dry technology and wet technology. Geographically, it is analyzed across North America, Europe, Asia-Pacific, and LAMEA. Product launch: Flour with higher efficiencies for different innovations is introduced in the market. Agreement and partnership: The leading players are signing supply & sales agreements and plant manufacturing partnerships to capture major market share and compete with other players. The market is driven by the product launch strategy, accounting for 38% of the overall strategies. Acquisitions, agreements, partnerships, joint ventures, and expansions are other prominent strategies adopted by key players to remain competitive in the market. Companies launch new products to increase their market penetration. About 38% of the studied strategies were product launches in the flour industry. Bread & bakery products, noodles & pasta, animal feed (including pet food), wafers, crackers & biscuits, non-food applications (including bio-plastics, biomaterials, glue) are gaining increased traction across world, which has led to increased number of flour manufacturers. Key players such as Ardent Mills, Archer Daniels Midland Co., Associated British Foods plc, ConAgra Foods, Inc., General Mills Inc., Hindustan Unilever Limited, Willmar International Limited, and Cargill enhance their product portfolios by launching flour with different qualities for different applications. For instance, in 2016, Ardent Mills announced its intent to acquire the Mondelz Canada flour mill, located in Mississauga, Ontario, Canada. The mill produces hard and soft wheat flour for its Canadian bakeries and a number of food manufacturing customers. The transaction is expected to close in the next few weeks. In addition, in 2015, Ardent Mills, the premier flour-milling and ingredients company, partnered with the Colorado Rapids of Major League Soccer (MLS) for a season-long giving program to benefit Food Bank of the Rock. Increased number of consumers are on the lookout for healthier foods that are made with natural ingredients, and have a good taste. ADM is already helping customers meet that growing demand with its comprehensive portfolio of ingredients and flavors. Currently, it is expanding its portfolio even further by offering customers worldwide with a wide array of great stevia and monk fruit sweeteners. They are pleased to partner with GLG, which has a demonstrated advantage in developing non-GMO stevia varietals and a pipeline of future innovative products. Around 31% of the companies analyzed adopted acquisition as their key strategy to gain expertise in the field of flour industry. For instance, in 2015, Cargill expanded its feed formulation expertise through acquisition of Format International Ltd, a leading global feed formulation software company with more than 30 years of experience and more than 5,000 users across 93 countries. Format International specializes in the design, authoring, and marketing of recipe optimization, ingredient allocation, and food & feed formulation solutions for the animal feed, aqua feed, pet food, human food, premix, and other industries. Companies are entering various types of agreements and partnerships such as supply & sales agreements and plant manufacture partnerships to serve their customers in a better manner and increase market outreach. Leading market player, General Mills, recently announced a strategic sourcing partnership with the largest organic cooperative in the U.S. that will help about 20 dairy farms add around 3,000 acres to organic dairy production over the next three years. Companies are collaborating with other companies to enter into a joint venture to create one of the leading FMCG companies. Leading market player, Willmar International Limited proposed to form a joint venture with both Adani Wilmar and Ruchi Soya, contributing their procurement, marketing, sales, and distribution businesses together (for specified products) with their respective stables of leading brands. Hindustan Unilever Limited (HUL) recently announced that it signed an agreement for the sale and transfer of its bread & bakery business under the brand “Modern” to Nimman Foods Private Limited, an investee company of the Everstone Group, for an undisclosed consideration. HUL’s decision to divest is in line with its strategy to exit non-core businesses while continuing to drive its growth agenda in the core packaged foods business. Currently, bread & bakery products segment has witnessed large-scale adoption of flour, owing to increase in demand for bread. Moreover, rise in government support fuels the need for flour products. 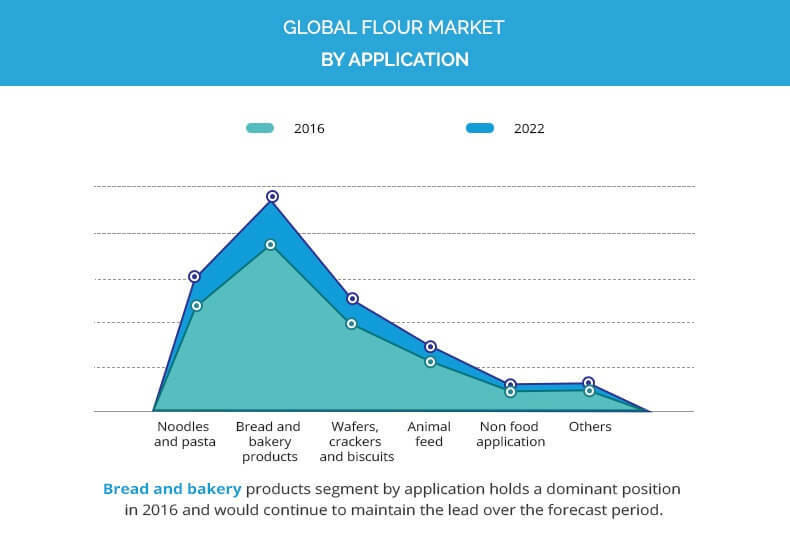 Noodles & pasta, wafers, crackers & biscuits, animal feed, and others are other popular segments in the global flour market. The rapid growth of flour in these applications is expected in subsequent years due to rising demand for flour and need for higher quality flour. Increase in adoption of flour in bread & bakery products and noodles & pasta is expected to rise with highest market share and are identified as the profitable targets for investment. As compared to the other segments, these applications possess larger market size by value. Other emerging applications such as wafers, crackers & biscuits, and animal feed are expected to witness good growth in the coming years. However, these applications currently possess small market size, in terms of value. Other applications including non-food application (including bio-plastics, biomaterials, glue) and others (including roux and baby food) are at emerging stage in the market; however, they are projected to grow rapidly in the future. Key players operating in the global flour market are Ardent Mills Canada, Archer Daniels Midland Company, Associated British Foods plc, ConAgra Foods, Inc., General Mills Inc., Hindustan Unilever Limited, Hodgson Mill, ITC Limited, King Arthur Flour Company, Inc., and White Wings and Willmar International. Other players (not included in this report) in the flour market involved in the manufacture and supply of flour include US Durum Milling Inc., Hayden Flour Mills, Sunrise Flour Mill, North American Millers Association, Grain Craft, To Your Health Sprouted Flour Co., Heartland Mills Inc., The Birkett Mills, ADM Milling Co., Horizon Milling, Satake USA, and Fairheaven Organic Flour Mill. 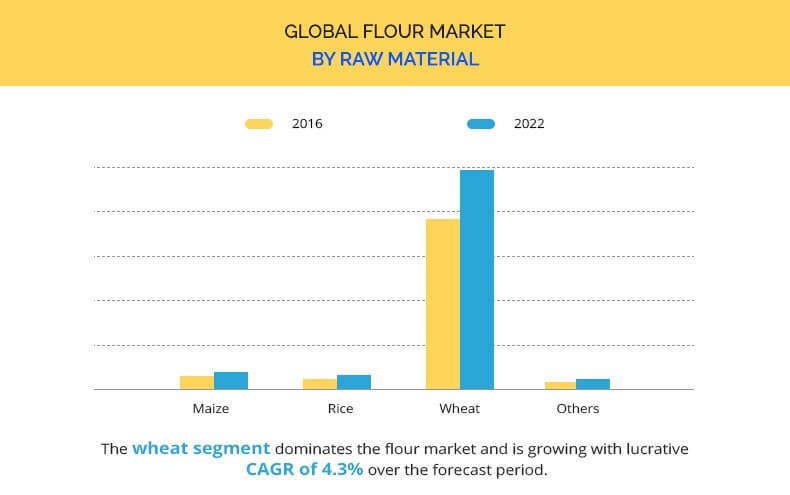 The study provides an in-depth analysis of the flour market with key drivers, restraints, and opportunities with impact analysis to elucidate the imminent investment pockets. Current and future trends are outlined to determine the overall flour market potential and single out profitable trends to gain a stronger foothold. Quantitative analysis of the current market and future estimations through 2014-2022 are provided to showcase the financial competency of the market. By geography, Europe accounted for the largest share in the global flour market due to increase in inclination of consumers towards bread & bakery products. Asia-Pacific is further expected to account for the second largest share in the global market, owing to growth in population as well as rise in trend among youngsters following Western food habits and food products. Asia-Pacific is expected to register a significant growth rate over the forecast period.